This guy is a companion of mine in a way. Him and his kin of all shapes have appeared under all of the city’s bridges this summertime, supposedly as a project of art in unexpected places. Stands to reason that they picked these places, too, as V. is a city so very defined by its river and the bridges across it. Each of the bridges has its own character (the White, the Green, the King Mindaugas, the Žvėrynas/Menagerie…), and now each has a silvery shape dangling underneath it: a ball, a spiral, a straight stick, a sort of a cone. There are three roads to choose from when going from our house to work, one of which leads under this bridge. When cycling, A. and I almost always take this one, and it’s good for walking too, as it goes on right by the river and is open and airy. Without fail, the silver ball is there to greet me every time. 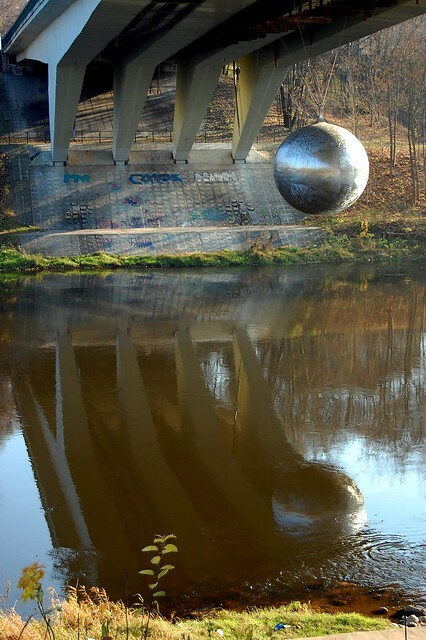 A few days ago, taking my camera for a walk after a long hiatus, I spent several minutes playing around with the perspective of the bridge, the ball, and the river reflection. It is, indeed, better with this art than it was without.